Special fried rice steady and delicious - It is no doubt one of the foods that almost all the majority likes and hooked to the fried rice. 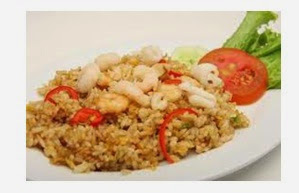 The menu is available also very bervareasi one of them is special fried rice. Each café or shop must have a prescription vareasi continue if you also often make fried rice at home? Well at kesemaptan this time I will share information about the recipe and how to make special fried rice squid One of my analah menu is squid / shrimp I really like seafoods or seafood to further let's follow the steps below. 2 heat pan with margarine and then input garlic and onion puree that had been in the skillet to the heat already. 3. then input the squid pieces and then stir in little by little until the visible honor. 4. input rice little by little Gradual 'after that stir until evenly, do not forget to input the salt / mecin to taste if you like chili and soy sauce enter and stir until blended and pervasive. Then if it is cooked turn off the stove and lift slowly and now you can enjoy a menu of fried rice made ​​your own squid secial. Thank you for visiting our blog do not forget if you like this article please share it via social medai below. 0 Response to "Latest squid fried rice recipe"